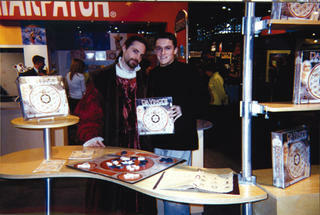 Da Vinci's Challenge debuted this year at the International Toy Fair at the Javitz Center in NYC. The response was excellent, with alot of credit going to Doug Lory, who played an excellent Leonardo da Vinci for the convention. 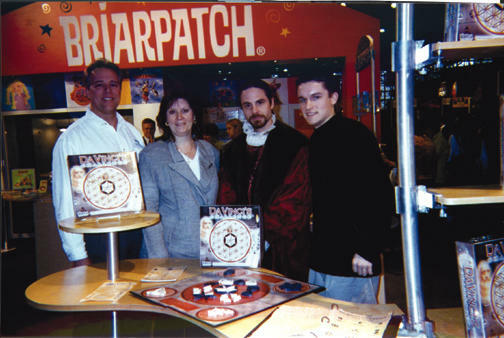 It was overwhelming to see something I created and have spent so much time, thought, and effort on get a prime spot at the the booth of a major toy company, Briarpatch. The display was right on the aisle, right smack in the middle of the convention center. The fact that this was right on my 27th birthday was just the icing on the cake! 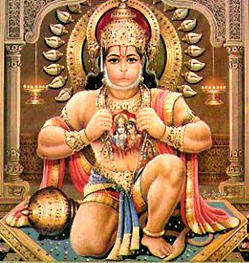 Welcome to The Monkey Buddha! Hopefully, this will be a place where I can finally share the ridiculous amount of info I have stored in my brain and its silicon symbiote I call my Apple Computer. I am looking forward to posting all kinds of important news, nuggets of crazy wisdom, interesting technologies, political rants, and useless fun crap. "Da Vinci's Challenge" originated as a senior graphic design project at Rowan University. I hand-made the original out of stone, copper, wood, and parchment paper. I have spent the past few years developing it into a board game for the mass market. The concept, game rules, design, and graphics are all my handiwork. It is a unique piece of functional artwork that combines elements of ancient mysteries, art, geometry, strategy, and history. It will hopefully be a source of imagination and inspiration in these dark times of war, deception, and confusion. I will give more info about the symbolism & progress of the game in later posts.